Default Inventor Settings... That's Great! How Do I Change It? I've often mentioned how there are certain things I change as soon as I install my new seat of Inventor. I've done this for as many releases as I can remember, and while not everyone likes my settings, many a user has thanked me for my input, and adopted one of my suggestions. So after far too long, here's the settings that I change in a part. You can find them under Tools>Application Options, on the Sketch Tab. 1) Grids - I don't like the clutter of the grids. I leave the axis, because I like the fact that seeing the axis leave me with feedback letting me know when a sketch is active. 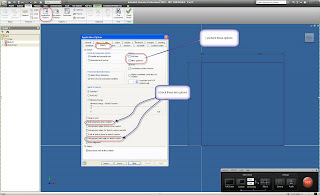 2) Edit Dimension When Placed - The default requires an extra click to edit the dimension. I check it so the dialog pops up when I place it. 3) Project Origin on Sketch Create - The default doesn't create a point on origin. I like to constrain to origin myself (must be a holdover from my days at the tool and die shop). So I check this one too. I've included a Youtube video that shows me changing the steps as well. Feel free to follow the link HERE! Looking back on this, all if these settings are now default in the newer versions of Inventor. Apparently many users thought as I did! You're welcome! Thanks for taking a few moments to swing by the blog! Importing a Rhino (file into Inventor that is). 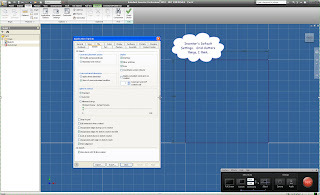 Autodesk Assistance Program... Did you know?